The planned outsourcing of staff at Wrightington, Wigan and Leigh NHS Trust is not in the interests of staff nor patients, says UNISON. 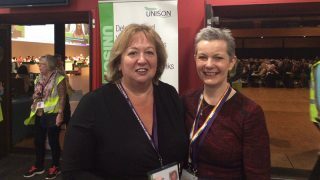 UNISON general secretary Dave Prentis has written to the head of the north west NHS Trust outlining some key concerns about the proposal to establish a wholly owned subsidiary. Around 900 staff, working as porters, cleaners and caterers, would be transferred to the new company, WWL Solutions. UNISON research finds that the case for outsourcing is based almost entirely on tax advantages, and not on service improvement. It also finds that wholly owned subsidiaries are creating a two-tier workforce, where new staff are likely to be far worse off in terms of their pay and pensions. There is also no evidence that these new companies improve efficiency or productivity. 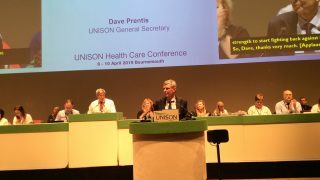 UNISON general secretary Dave Prentis said: “There’s no good reason for this outsourcing – it’s bad for patients and bad for the staff that support them. A 5-day strike by staff at Wrightington, Wigan and Leigh NHS Trust starts at 6am on Thursday 28 June. This is the third strike by employees in protest at the proposals. On 27 June, the Wrightington, Wigan and Leigh NHS Trust board will make a final decision on the setting up of a wholly owned subsidiary. – UNISON general secretary Dave Prentis will be on the picket line of Wrightington, Wigan and Leigh NHS Trust in the morning on Thursday 28 June.